Huddled under a colourful autumn canopy, in a secluded corner of Vancouver’s Stanley Park, Rod Mickleburgh found a Remembrance Day ceremony that refused to forget Canada’s racist past. 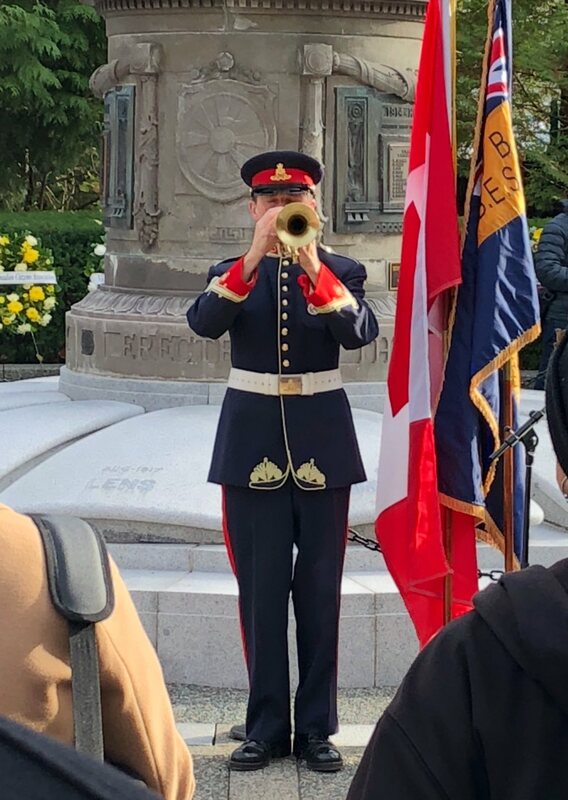 Bombardier Darrell Penner plays The Last Post at the Japanese Canadian War Memorial in Stanley Park. VANCOUVER, BC — For the past few years on Remembrance Day, I’ve skipped the crowds at the main cenotaph downtown in favour of the homespun but equally heartfelt ceremony at the striking Japanese Canadian War Memorial in Stanley Park. Given the history of suffering Japanese-Canadians endured in their adopted land, I find it moving in a way that is different from the equally affecting remembrance at Victory Square. The memorial is in a lovely secluded spot surrounded by trees in their dapper fall colours. Erected in 1920 on the anniversary of Vimy Ridge, after a successful fund-raising drive, it commemorates the 54 Nikkei who volunteered to fight, then died, for a country that denied them the vote. Such was also the racism in their home province that they had had to travel all the way to Alberta to sign up, after bigoted local recruiters refused to accept them as soldiers fit for the Canadian forces. The memorial is in a lovely secluded spot surrounded by trees in their dapper fall colours. Erected in 1920 on the anniversary of Vimy Ridge, after a successful fund-raising drive, it commemorates the 54 Nikkei who volunteered to fight, then died, for a country that denied them the vote. “Without the franchise, they fought to prove they were Canadian,” ceremony moderator Gordon Kadota told us. Another 150 or so Nikkei enlistees did survive the carnage. But not until 1931 was the government shamed into giving these few ethnic Japanese a special dispensation to vote, their willingness to shed blood for Canada notwithstanding. “Lest we forget,” intoned Mr. Kadota. Bombardier Darrell Penner played the Last Post, his haunting bugle piercing the morning chill. Somewhere around 11 o’clock, we bowed our heads for two minutes of silence. Piper Edward McIlwaine did a moving Lament, Darrell Penner returned to bugle Reveille, young Eileen Kitamura read out In Flanders Field, and David Mitsui, grandson of First World War hero Masumi Mitsui, proclaimed the Act of Remembrance. There was an added poignancy to this year’s observance, along with being the 100th anniversary of the end of World War I. “Since the last one, we have lost four of our veterans,” said Mr. Kadota. And I was personally saddened to see that Minoru (“Min”) Yatabe was among those who didn’t make it to another Remembrance Day. He passed away a mere month short of November 11th at the age of 96. 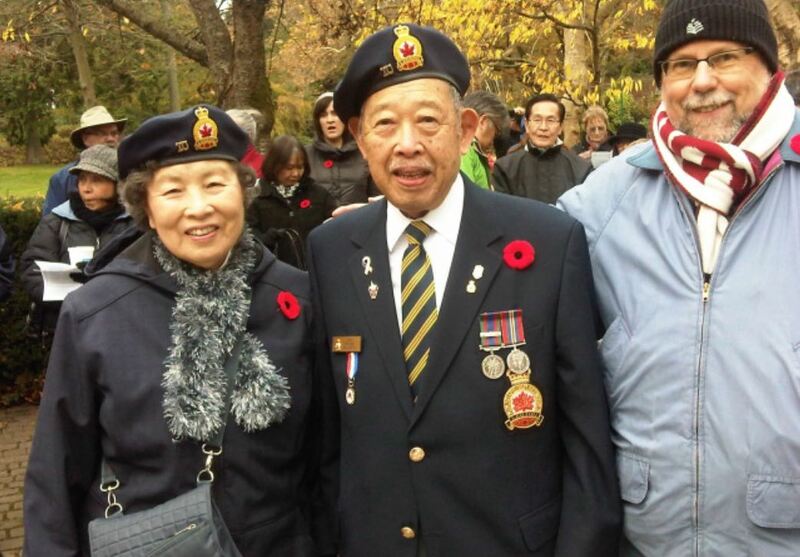 I was privileged to have met “Min” when he journeyed here from Toronto to attend ceremonies at the Japanese Canadian War Memorial in 2012. He was as lovely and cheery an individual as one could ever hope to encounter, still full of life. “Min” had been part of the small Japanese Canadian contingent who set aside the way their race had been treated and volunteered for overseas duty in the Pacific against Japan. The hidebound Canadian army had to be pressured to let them enlist by the British, who saw their language skills as invaluable. Remembering: Rod Mickleburgh (right) poses with “Min” and his wife Lydia at the Remembrance Day ceremony in 2012. Photo courtesy of Rod Mickleburgh. The shameful legacy of Japanese-Canadian internment camps during the Second World War is explored in this short video from Legion Magazine, featuring David Suzuki. More than 20,000 residents were displaced and labelled a “menace” after the attacks on Pearl Harbour, the largest single relocation of souls in Canadian history. To read more Mickleburgh, visit the archive or head over to Mickleblog.com. 1 Reply to "Lest We Forget the heroes once branded “enemy aliens”"
a fine piece of writing. We all have to remember this sad and sorrowful moment for Canada and this brutal and unjust treatment of the Japanese Canadians. Injustice remembered, but do we learn from our mistakes. ?